TORONTO, February 21, 2019 – Proposed changes by Canadian securities regulators to the reporting of non-standard accounting metrics will have a profound effect on the responsibilities of corporate directors and the audit committees of public companies. By formalizing the reporting of customized earnings metrics that deviate from generally accepted accounting principles (GAAP) — widely referred to as “non-GAAP” financial measures — regulators are shifting non-standard financial reporting from guidance to compliance. The Canadian Securities Administrators (CSA), an umbrella group comprising provincial securities commissions across Canada, recently closed its 90-day consultation period on the proposed national instrument and companion policy to bring greater discipline to the use of non-GAAP financial measures. The new regulations address the exponential growth of common non-GAAP measures — such as adjusted earnings, free cash flow, and pro forma earnings — that has alarmed investors and regulators alike. “There’s been a lot of questions and concerns expressed by the securities regulators for 15 years or more already,” says Richard Olfert, managing partner of regulatory, quality and risk at Deloitte Canada. “It certainly formalizes the requirements — and the requirements are more comprehensive than the guidance was.” Unlike the existing regulatory guidance, the new rules would have the force of law. Securities watchdogs would have more bite if a company’s non-GAAP financial measures are misleading. Critics argue that bespoke metrics inflate earnings, lack consistency and disguise deteriorating financial performance — they exist to paint the rosiest picture possible. Yet non-GAAP measures are widely used by public companies. Toronto-based Veritas Investment Research found that nearly 80 per cent of companies listed in the S&P/TSX 60 used a non-GAAP measure of net income in 2016. Audit Analytics, a U.S. research firm, found that more than 90 per cent of S&P 500 companies used non-GAAP metrics between 2015 and 2017. 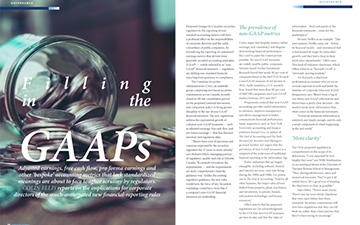 Proponents contend that non-GAAP accounting provides useful information to investors, improves transparency and allows management to better communicate financial performance. Some supporters, such as New York University accounting and finance professor Baruch Lev, co-author of The End of Accounting and the Path Forward for Investors and Managers, go much further. Lev argues that the prevalence of non-GAAP measures is a symptom of the irrelevance of traditional financial reporting in the Information Age. Art Korpach, a chartered professional accountant who serves on several corporate boards and holds the Institute of Corporate Directors’ ICD.D designation, says “there’s been a tug of war about non-GAAP information and there’s been a pretty clear decision – the market needs more information than what comes in the financial statements. Proposed changes by securities regulators to bring closer oversight to the reporting of non-standard accounting metrics will increase the responsibilities of corporate directors and the audit committees of public companies. Non-GAAP measures are widely used by public companies but lack consistency and can be used to inflate reported earnings or disguise problems. Proponents say non-GAAP numbers provide useful information to investors, improve transparency and allow management to better communicate financial performance. Corporate directors will need to ask management in-depth questions about which non-GAAP information appears and the frequency and consistency of the measures. The new companion policy makes clear that the requirements for non-GAAP disclosure extend far beyond voluntary disclosure in financial statements — such as the management discussion and analysis (MD&A) — to communications channels such as websites, press releases and even social media such as Twitter. The CSA’s proposed new regulations should pique the interest of corporate directors, Olfert says. That interest could range from curiosity to more in-depth questions about the use of corporate communications channels, the kinds of documents in which non-GAAP information appears, and the frequency and consistency of the measures. Olfert suggests another “more far-reaching” implication for corporate directors and audit committees. “Maybe we should stop and think about how we’re telling our financial story as a whole. Many organizations are putting information into the marketplace that is not financial but is incredibly important to the impression that the capital markets form about those companies and how they value them.” Audit committees may want to ask whether beyond-GAAP measures have the same consistency and rigour as regulated ones, he says. He questions the value of requiring detailed non-GAAP reconciliations in all documents rather than just for the annual core documents. “Has society been that wronged by what’s been going on?,” Korpach asks, adding that the new regulations don’t address the real issue: Today’s financial statements aren’t providing enough of the information that investors need. By Colin Ellis, managing editor of Canadian Accountant. This article originally appeared in the January/February 2019 issue of Director Journal, published by the Institute of Corporate Directors.